FERGUSON, Mo. -- The police chief in the St. Louis suburb of Ferguson resigned Wednesday in the wake of a scathing Justice Department report prompted by the fatal shooting of an unarmed black 18-year-old by a white police officer. The city said in a statement that it reached a mutual separation agreement with Chief Thomas Jackson, who will get a severance payment and health insurance for a year. Lt. Col. Al Eickhoff will become acting chief March 19 while the city searches for a replacement. Jackson had previously resisted calls by protesters and some of Missouri's top elected leaders to step down over his handling of the August shooting of Michael Brown and the weeks of sometimes-violent protests that followed. Several text and phone messages left with Mayor James Knowles III and Jackson were not returned. Jackson told the St. Louis Post-Dispatch that he felt it was time for the city to move on. "I believe this is the appropriate thing to do at this time," Jackson said. "This city needs to move forward without any distractions." Jackson becomes the sixth employee to resign or be fired after the U.S. Department of Justice last week issued a report that cleared Officer Darren Wilson of civil rights charges in the shooting but found a profit-driven court system and widespread racial bias in the city police department. 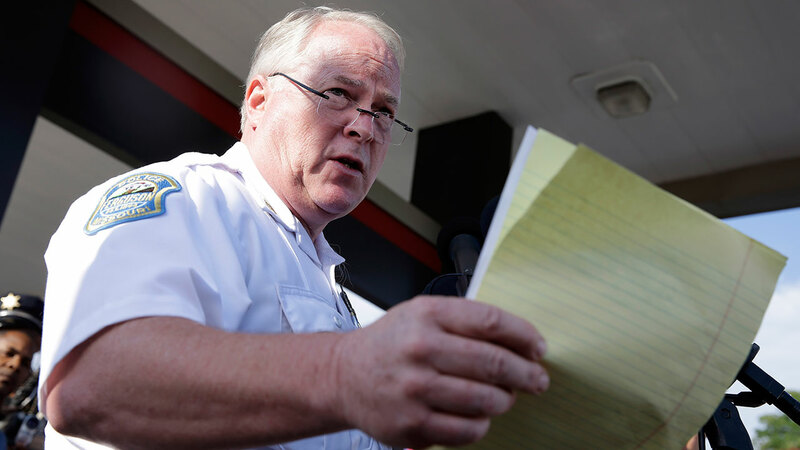 The police chief's resignation was welcomed by state lawmakers who represent Ferguson. "There would be a lot of people that would approve of that," said Democratic state Rep. Sharon Pace, who represents the neighborhood where Michael Brown was shot. His handling of the situation drew wide criticism from the outset, both for the aggressive police response to protesters and for his agency's erratic and infrequent releases of key information. Attorney General Chris Koster and U.S. Senator Claire McCaskill were among those working behind the scenes to get him to resign, but Jackson stood firm. Since the Aug. 9 shooting, he has spoken of a desire to work with community members and described efforts to bolster minority hiring in a department that had just three black officers at the time of Brown's death. But he struggled to manage a local crisis that turned into an international event and explain his decision-making at news conferences disrupted by angry protesters and grieving community members. Then the Justice Department issued its report, which found that Ferguson's police and court systems functioned as a money-making enterprise rather than one meant to ensure public safety. The report found black drivers in Ferguson were more than twice as likely as others to be searched during routine traffic stops and more likely to face excessive force from police, often during unwarranted stops. Investigators also noted that Ferguson was counting on revenues from fines and fees to generate nearly a quarter of its total $13.3 million budget for the 2015 fiscal year. Many residents ended up in jail after missing court dates or failing to pay fines for minor violations. The report also uncovered evidence that three employees - a court clerk and two police officers - had sent racist emails. The clerk was fired last week and two officers resigned. The judge who oversaw the court system also resigned and the City Council on Tuesday agreed to a separation agreement with the city manager.